Winter clothes are clothing items worn for protection against the cold weather of winter. 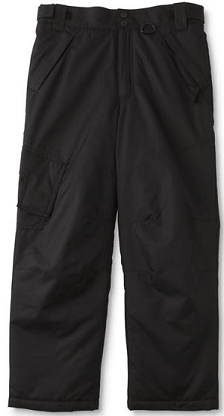 Snow pants are designed to keep the wearer warm and dry when exposed to snow conditions. Snow is precipitation in the form of flakes of crystalline water ice that falls from clouds. Snow is a granular material that is composed of small ice particles. As we all know, “ice” is cold. Therefore it is a good idea for humans to wear clothing to protect ourselves from prolonged stays in the snow. Snow pants come in a variety of styles. They are often referred to as snow pants, ski pants, bibs, or snowboarding pants. Trousers or pants are an item of clothing worn from the waist to the ankles, covering both legs separately (rather than with cloth extending across both legs as in robes, skirts, and dresses. Snow pants also may have a bib area that would extend to cover the torso of the wearer. Bib overalls typically offer protection with a water-resistant nylon shell and synthetic insulation. But can be made in other fabrics and with natural insulation such as down/feathers. The straps are usually adjustable for a fit that conforms to the wearers build. A stretch waist and snow cuffs are meant to stay in place and keep out the elements. For men, woman, and children who enjoy spending the winter season outdoors snowpants are the way to go. They are generally insulated pants with a durable water repellent finish to keep you bone dry and warm during long days on the slopes, ice skating, sledding or having a snow ball fight. Some ski pants may have articulated knees which allow for a greater range of motion, making them ideal for snow sports. Find snow pants for boys, girls and adults so you can enjoy the snow while staying warm. Be prepared for anything Mother Nature has to offer this winter in the appropriate pants to keep you warm & dry. Winter clothes such as snow pants are used for sports and recreation activities includes skiing, snowboarding, and snowmobiling. You can also research ski suits and snowmobile suits which are other options. Be prepared for anything Mother Nature has to offer this winter. It would probably be a good idea to also learn about winter boots and rain boots which can also be beneficial when doing outdoor activities in snowing conditions. Popular snow pant brands include Marmot, Burton, Volcom & Neff. Learn about snow boots, knit hats, gloves & mittens if you are planning on snowing adventures. If you enjoy learning about different pant styles, you may also have interest in learn about jeans, yoga pants, chinos, slim pants and khakis. Are you ready to hit the slopes in the protective warmth and cool style of snow pants?